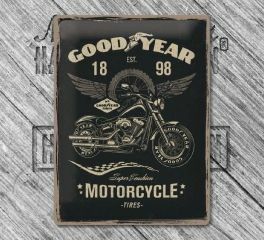 Harley-Davidson® Goodyear Motorcycle Tin Sign is made from thick steel sheet metal. Arched and embossed, crimped over edgings, rounded corners and pre-drilled holes. It measures 30 x 40 cm. 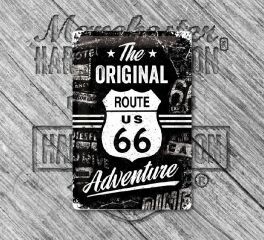 Harley-Davidson® Metal Vintage Retro Tin Sign mesasures 30 x 40 cm. It is made of extra thick steel sheet metal in brilliant colours and protective lacquer. Arched and embossed, crimped over edgings, rounded corners and pre-drilled holes. Harley-Davidson® Motorcycle Models Chart Tin Sign measure 30 x 40 cm. It is made of metal sheet. It has also pre-drilled holes. Perfect gift idea to your friends and love ones. 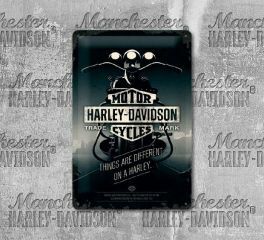 Harley-Davidson® Brick Wall Advertising Tin Sign measures 30 x 40 cm. It is made of thick steel metal sheet. Arched and embossed motif, rounded and perforated rolled-up edge corners. 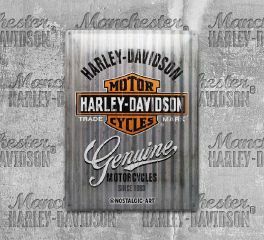 Harley-Davidson® Things Are Different Medium Tin Sign measure 20 x 30 cm. Perfect for your home, as well as gift to your friends and love ones. 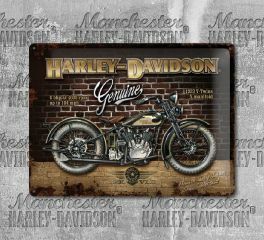 Harley-Davidson® Best Garage Tin Sign measures 20 x 30 cm. Made of extra thick steel sheet metal in brilliant colours and protective lacquer. Arched and embossed, crimped over edgings, rounded corners and pre-drilled holes. Harley-Davidson® Genuine Logo Multicolored Magnet's dimension is 6 x 8 cm. 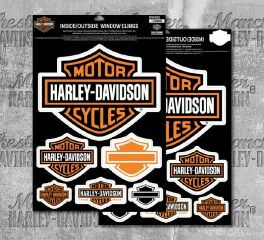 Harley-Davidson® Bar & Shield® Inside or Outside Window Cling has color variations including silhouette Bar & Shields®, filled with orange or just black color (just the shape of the logo is enough to know it’s Harley-Davidson®. These logos are suitable for inside and outside application. The single sheet has logos on the front and the back. The sheet size is 15 x 19-inches, so the logos range in size from large to small. There are 12 clings in all, 6 on the front of the sheet, and 6 on the back of the sheet. 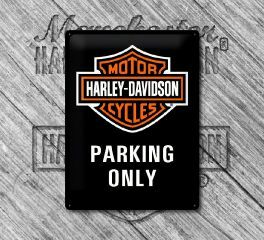 Sheet size: 11.5" x 17"
Harley-Davidson® Nostalgic H-D® Parking Only Tin Sign is made from thick steel panel, and features clinched edges, pre-drilled holes, curved, embossed in several layers. Harley-Davidson® Nostalgic Biker World Crushed Tin Sign is made from extra thick steel sheet metal, and image-embossed on multiple layers. Go home to Harley-Davidson® décor. Unique wall tins add a bit of rebel to any room.